In food processor, process parsley and cilantro with on-and-off motions until finely chopped. Add ricotta cheese, pepper sauce and yogurt; process until well blended. Pour into quart-size resealable food-storage plastic bag. Seal bag; refrigerate sauce until needed. In 10-inch nonstick skillet, cook ground chicken over medium-high heat, stirring frequently, until no longer pink; drain if necessary. Stir in water, taco seasoning mix and corn. Cook 2 to 3 minutes, stirring occasionally, until thoroughly heated and slightly thickened. 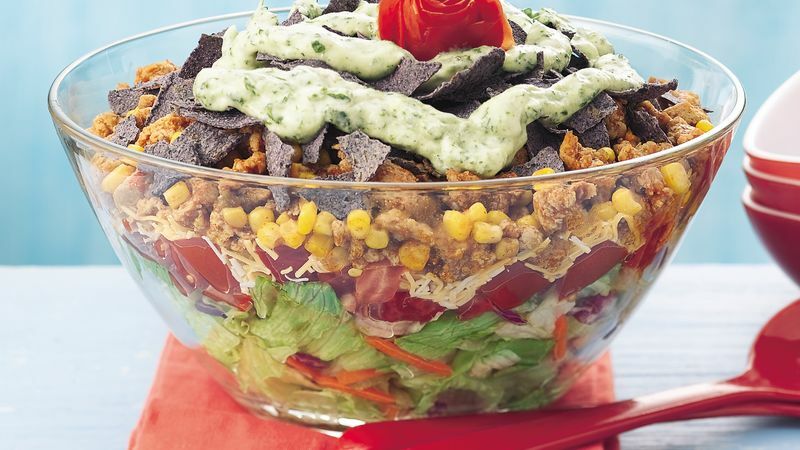 In 3- to 4-quart glass bowl, layer salad mix, chopped tomatoes, cheese, chicken mixture and tortilla chips. Cut hole in one bottom corner of bag of sauce; pipe sauce in coil over salad. For garnish, cut skin of large tomato to form a rose; place in center of salad.